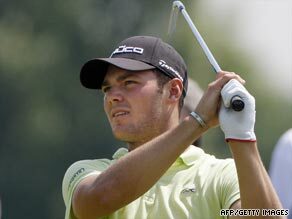 (CNN) -- Germany's Martin Kaymer defied scorching heat and a blistered foot to card an opening round nine-under 62 for a three-stroke lead in the French Open on Thursday. Kaymer defied the heat and a foot injury to score a superb opening round 62 in the French Open. The 24-year-old equalled the course record at Le Golf National, despite his right foot hurting so much that a doctor cut a hole in his golf shoe to allow him to play Wednesday's pro-am. With the help of his three partners he won that event with an amazing 16-under-par best-ball of 55, but to be only seven worse than that score on his own showed what a massive talent he is. "I've been missing a lot of short putts, but everything came together -- and I hope it continues," Kaymer told Press Association Sport after taking a three-stroke lead over England's 2006 winner John Bickerton, Thai Thongchai Jaidee, Australian Scott Strange, Swede Peter Hanson and Argentine Rafa Echenique, the man who was second to Nick Dougherty in Munich on Sunday after a closing albatross. "The foot's still hurting, but I will survive," added Kaymer. "Yesterday when I was practising it was unbelievable pain, but now I don't worry about it." Kaymer's round actually began with a bogey, but after five birdies in the next nine holes he chipped in for eagle at the long third and finished with three more birdies for an inward 30. However, there was bad news for a host of big names trying to fine-tune their games ahead of this month's British Open at Turnberry. Defending British Open champion Padraig Harrington carded a one-over-par round of 72 but the Irishman still managed to perform better than fellow-major winners Jose Maria Olazabal, Angel Cabrera and John Daly. Daly was already eight-over-par when he quit with a back injury on the 17th hole. Olazabal posted a 74 and the 75 of current Masters champion Cabrera meant he even finished five shots behind his 20-year-old son Federico. Miguel Angel Jimenez, whose 500th European Tour event began with a hook into the water, hit back for a 67 and fellow-Spaniard Pablo Larrazabal, the defending champion, matched that with five birdies in the last six holes -- after a triple bogey eight on the ninth.